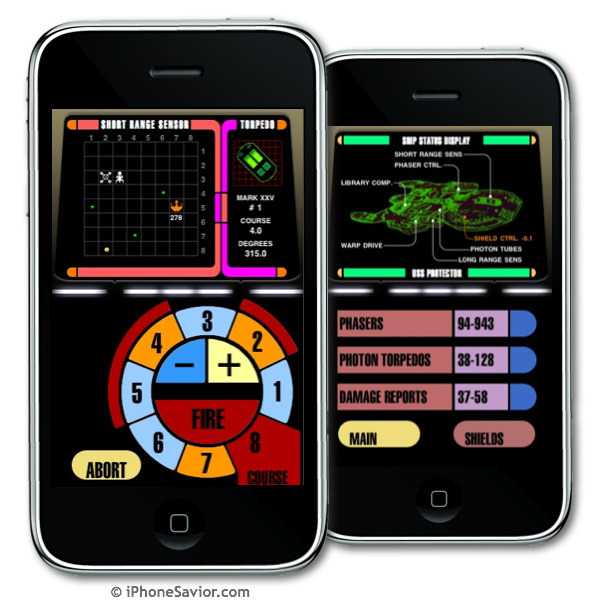 Matthias Schorer, creator of the wildly popular Tricorder TR-580 app has taken his latest inspiration form the 1970's classic "Super Star Trek" computer geek game to create Trek Quest ($.99) for iPhone. The goal of Trek Quest is to wipe out a fleet of Krygon (Klingon) warships before they can attack Federation headquarters. A small task for a seasoned U.S.S. Starship commander. Schorer was quick to poin t out that his Trek Quest app was reimagined as a combination of "StarTrek" and "Super Star Trek", written and rewritten by Dave Matuszek, Paul Reynolds, Don Smith and Tom Almay. You can read more about the lineage of Super Star Trek as chronicled by Tom Almay on his own website. The teletype based user interface of the original game has been replaced in Trek Quest by a graphical, modern theme, seen in many Science Fiction movies, according to Matthias. Although the screen real estate dedicated to the game grid is a tad small for iPhone, the screenshots, sound effects and Next Generation style graphics for Trek Quest are really well done. But that didn't make the gameplay any easier for me to grasp after a few focused attempts. This retro themed app appears to be aimed at updating a classic computer nerd game and then dressed up for Trekkies. Which makes it more appealing for a galaxy of PC geeks who prefer to linger on a cerebral experience pulled from a bygone era. It's an idea that will be lost on many iPhone gamers, but priced right for the incurable Star Trek curious.